Already as a 15-year-old I followed my calling to be a ski instructor and since 1990 I am a certified ski instructor and ski guide. 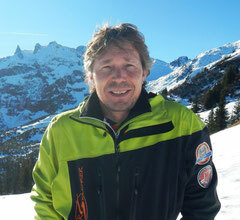 I practice this amazing profession with great joy and would love to share my enthusiasm for skiing with you. I have more than 30 years of professional experience in the Montafon Mountains, and also several seasons at Mount Buller in Australia. I share my passion for winter sports with my three children and my wife, who loves skiing just as much as I do.